Upon visiting the Elgin area of Arizona, three wineries are side by side by side. This triplet consists of Kief-Joshua Vineyard, Flying Leap Vineyards, and Callaghan Vineyards. We visited all three in the same trip, however, this particular post is about Flying Leap. Please see our other posts for information about the other two wineries. Flying Leap Vineyards was founded very recently in 2010. The first grapes were planted in 2011. Here, in 2013, we were tasting their wines. The only word I could find to describe the tasting room and outside scenery would be "rustic." The outside contained empty bottles turned upside down and buried in the ground. Eric found the bottles cool and charming, I didn't really understand them. It didn't really seem like decoration to me. (As a side note, we did a mini-poll in the tasting room and the men loved the bottle decor, the women all agreed that it was strange.) The room itself consisted of a small tasting bar to one side of a room filled with barrels. There wasn't any seating or any knick-knacks for purchase. The purpose of this tasting room was only to taste wine. For the tasting, we were able to sample each of the six wines that were made available. On the whole, we were pleasantly surprised with the quality of the wines. Generally, young wineries need time to mature and to find their footing, however, Flying Leap definitely hit the ground running. The reds were very smooth with a nice bouquet and a good finish. My favorite wine was the Cabernet Sauvignon 2010. The white wine that they featured was the Albarino 2011. The wine was distinctly citrus both in the nose and in flavor. We sampled one dessert wine, the Estate Finale 2009. To me, it tasted more like a port. Eric really enjoyed it, whereas I prefer a sweeter dessert wine. We did find the prices for the wines a little high. For a table wine, we generally prefer our wines to be in the $15-22 range. Most of the wines were above this range. It may be because the winery is young and eventually the prices may drop, however, that is pure speculation. One item of particular note is that Flying Leap Vineyards receives help in developing their wines from Callaghan Vineyards. If you have ever visited Callaghan (which we recommend! ), you understand how important this mentoring can be to a young winery. We loved how wineries in the area were helping each other to develop the reputation of Arizona wines. For more information, visit their website at www.flyingleapvineyards.com or better yet, pay them a visit at 342 Elgin Road, Elgin, Arizona! Have you been to Flying Leap? Tell us about your experience by commenting below! 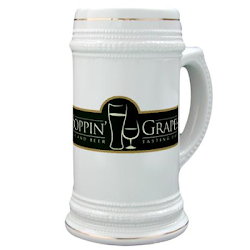 Should we carry Flying Leap Wines at our Hoppin' Grapes Wine and Beer Tasting Bar in Sierra Vista, Arizona?